Two recent posts by Dan Kahan at his Cultural Cognition blog have revealed how completely clueless the American public is on climate change. 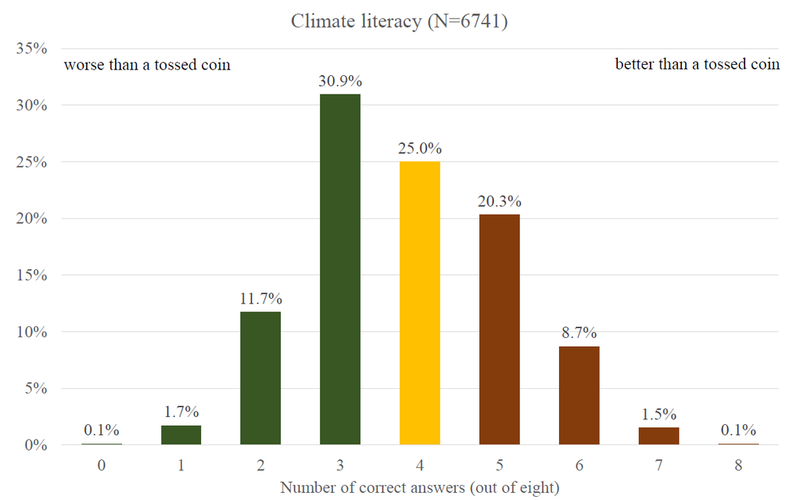 In a cleverly designed survey, he asked some questions of the type “Most climate scientists believe human-caused warming will lead to flooding of some coastal areas, True/False” for which the correct answer is true, but also some red-herring-alarm questions such as “climate scientists believe human-caused warming will increase the risk of skin cancer”. He finds that about 75% of people believe these false scares, such as the cancer one, one about warming having caused more tornadoes, two questions about aerosols and sulphur emissions being responsible for global warming, and one about carbon dioxide reducing photosynthesis in plants. Ordinary members of the public, regardless of what they “believe” about human-caused climate change, know pitifully little about the basic causes and consequences of global warming. He also finds that there is very little left-right divide on this: Republicans are almost as likely as Democrats to believe in these bogus climate alarm stories. You can read Dan’s paper about this here at SSRN, though the recent blog posts are about new surveys, which give similar results but are described as more ‘humungous’. Any hopes we smug Brits might have had that this just shows how stupid Americans are were dashed when Richard Tol and colleague Peter Dolton released similar data for the UK public. This survey was run by a professional survey company and used many of the same questions Kahan had used in his work. They found that 59% of people agreed that climate scientists believe CO2 will reduce plant photosynthesis, 70% thought climate change increases skin cancer, 87% correctly said that climate scientists think global warming could cause coastal flooding, a huge 88% fell for the idea that ice melting at the North Pole would cause sea levels to rise, and 70% incorrectly thought hurricanes are increasing. From Kahan’s paper the corresponding numbers for the US are 68%, 69%, 81%, 86% and 79%. So overall, it looks as though people in the UK are only very slightly less ignorant about climate change than Americans. The survey also asked how serious a problem people thought climate change was now, in 10 years time and in 100 years time. The results showed that on the whole people were very worried on the 100-year time-scale, and as Tol put it on twitter, People who know more worry less about climate change. We’ve been bombarded with information about climate change for the last 15 years or so, and there are dozens if not hundreds of organisations devoted to getting the message out. So how come people are still so completely clueless? This explanation fits with the finding about worry – of those who incorrectly fell for the bogus scare questions, 44% chose 10 on the climate worry scale, whereas 27% of those who knew more did. The climate scaremongers are succeeding in fooling and worrying a lot of people. There are other interesting points in the two Kahan posts. He finds that there’s a political divide, but also the political divide gets greater the more knowledgeable people are – conservatives get more sceptical the more they know about climate science while liberals’ belief increases. Also, as knowledge increases, belief that there’s a scientific consensus increases. Dan thinks these two results in combination are surprising (“Whoa!!! What gives? ?”); he seems to think it’s odd that intelligent people know there’s a consensus but don’t buy into it; in the comments, several people, including Barry Woods, Andy West and I have tried to explain why it isn’t, leading to an interesting discussion. Tags: Kahan, propaganda, public opinion, science, Tol. Bookmark the permalink. I think we can worry less about worry. Dan’s made some great instruments and collected some fantastic data. But the interpretation stages of his investigation are short circuited by the fact that he’s plugged into his analysis an assumption that the climate Consensus position is ‘true’, and hence that Rep / Cons must own all of the bias. (Rather one should let the full data pattern *tell us* where the origin of most bias lies, without an assumption of truth on any side). Hence some, not all, of his conclusions are invalid, in some cases unsurprisingly leading to ‘weird problems’.. Instead of a “universal latent fear that we’re all screwed”, in fact the Rep / Con majority and much of the Lib / Dem majority don’t believe a word of it. They think *the scientists* believe the scare stories, but they don’t believe these stories *themselves*. The remainder of the Lib / Dem majority are emotively committed to the concept of climate calamity, and appear to believe all of the scare stories themselves. (See my comments over there for details on all this). So all the scaremongering may well be back-firing. Most of the Rep / Cons and significant numbers from the Lib / Dem camp too, for the latter even among those who when identity challenge is an issue say they believe in calamitous AGW, are revealed to have no faith in climate science when that identity challenge is avoided. A problem though is that this doesn’t just devalue climate scientists, but all scientists. P.S. great article, Paul 🙂 Interesting UK data. Louise Gray made much of this in a 2010 article. Geoff Chambers tells me on the “Sources of the Climate Conspiracy Theory Conspiracy Theory” thread that when someone says climate change they mean natural climate change. No ifs, no buts, they mean natural climate change. To discuss anthropogenic climate change it is essential to use the word anthropogenic or an equivalent such as “human caused”, which Kahan uses. So please be consistent. Please add anthropogenic or human caused in your article or you’ll confuse everyone (for example “70% thought climate change increases skin cancer” is not what Kahan found, according to this rule). It should be noted that, for this part of the survey, we by and large followed Kahan. Most of the credit is his. Muddled, I say, muddled. I hate these surveys and the surveyors who do the surveying and expect enlightenment from the surveyed. The above quote makes no sense. The term “consensus” is ill defined and thus any use of it soon leads to muddled thoughts. Consider Richard Lindzen, a very knowledgeable person and skeptic. Does he know there is a scientific consensus when his very existence proves otherwise? I think you can look at this another way. The less engaged and interested the public are by any particular issue, the more likely they are to be ill-informed about that issue. This suggests to me that the public have shallowly absorbed the climate change message plugged relentlessly by the press and media. They have not looked beyond the headlines; they haven’t even faithfully absorbed the generally fairly consistent message in the headlines. They just aren’t interested, but they have been unable to avoid soaking up at least some of the relentless, all pervasive tide of climate doom and gloom spread by the media, green groups and government. As such, they are mildly to moderately worried but woefully ill-informed. You could say that the public are just thick. I prefer the more generous interpretation that they are overwhelmingly disengaged and disinterested in climate change and this reflects in their ignorance of the basic facts. So the alarmists have succeeded in making people vaguely worried, but they have failed miserably in getting them to be worried about the all important ‘facts’ – as they see them – relating to man-made climate change. This must be galling. There are only two small groups of people sufficiently knowledgeable about climate change to form a reasonably well-informed opinion; the believers who are on-board anyway and a growing number of sceptics who, on balance, are probably going to do a better job of engaging and informing the public of the reasons why they think catastrophic man-made global warming is NOT, and never will be, something to be deeply concerned about. He’s doing some great work, especially on the OCSI scale and emphasizing the critical nature of cultural identity regarding survey responses. It’s a huge shame that he so badly hobbles his solution space by not entertaining even the possibility that the output of the climate consensus may itself be a cultural artifact. This in turn completely derails several of his interpretations of what is valid and fantastic data collected via the OCSI surveys. If he is so confident that the output of the consensus is purely science, then he should allow the social analysis tell him this, not plug that assumption in as a fixed prior halfway through his analysis. Climate change is merely the latest but least well explained scientific scare story (irrespective of any real risk, most of them have some truth). If the public added up all the things that were going to shorten their lives they wouldn’t just be dead, they’d be a negative value dead before they were born. Similarly there’s a wonder cure announced every day that strangely never seems to materialise. Science has started to resemble the snake oil businesses it was supposed to debunk. Climate science tops the lot with its constant demand we sign on the dotted line before something dreadful happens. Don’t look at the small print, just act. It doesn’t matter what you do, so long as it’s cripplingly expensive. They can’t put a figure or a timescale on climate change, but it will be soon and massive. Think of your children! The science and the solutions are so shoddy that no warmist really likes to discuss them. Instead they prattle on about the consensus, which means whatever the warmist wants it to. How many whoppers have we seen some person in authority utter, waving the consensus flag? How rarely are those lies/mistakes corrected by ‘real’ scientists? No wonder the public are confused. If the full list of speculative claims against climate change (by which they mean AGW) was studied, are we sure that at least some of those erroneous answers have not been given by someone in authority (if not a chief scientist)? After all we’ve seen an admiral claim an island might capsize. Which of those answers was more daft than that? Climate science had one chance to be taken on trust and it delivered a pile of pooh. Now it doesn’t matter how much scientists or activists polish it, it still stinks. Like unrepentant dogs the scientists don’t even know that they’ve been bad. It turns out that pooh is how science is done apparently. Worryingly I’m beginning to think that they’re right. On a more positive note Dan Kahan gets closer to the truth every year. Sorry to be bluntly critical, but this seems a “water is wet” story used to serve as today’s delivery vehicle for pre-canned messaging. Meaning the desired payload message that the poor public is “brainwashed” by “propaganda put out by climate scientists” etc. The study of course says nothing of this, it merely says “the public doesn’t know that much” which is a common finding across any number of topics, particularly broad questions of scientific opinion or research. I suppose that is commenting on the obvious and being a downer at the party. I would agree with that. People aren’t dumb, they are just not that interested. Sports commentary, cooking programmes, and Game of Thrones reveal that your average Jack and Jill can relish tedious detail. geoffmprice, but the public aren’t brainwashed, that just it. As Jaime rightly points out, they’re bored of climate change. After the first (justifiably) panicky warnings, the messages have become more confused and ludicrous. The public know full well that if the bandwagon had a better message than the 97% consensus, they’d be using it. Pingback: Week in review – science edition | Climate Etc. @Dave, couldn’t get through Goodkind’s book actually, I found the political lecturing so shrill, tone-deaf, and artless. I know some similarly find GRR Martin’s writing frustratingly liberal, but his views of how the world works are woven into story and I find more provocative of ideas, especially into how power works and shapes perceptions. But perhaps I have too much affinity for “liberal” libertarianism. Yes, people are easy to fool. Those who believe they are above this are often ironically the most vulnerable. There may be confused and ludicrous messages, but not in general from scientists. Happy to discuss the examples you think you have. Now, “confused” is defensible – science is often confusing, riddled with unresolved contradictions and uncertainties. And climate projection deals with extremely difficult/complex intersections with weather systems etc. which make understanding patterns in areas like drought and hurricanes (or even short-term prediction of surface temperatures) anything but trivial and non-confusing. “Ludicrous” is more easily associated with the tsunami of self-contradictory nonsense coming from the various anti-AGW sects, but certainly shows up in some pro-GHG abatement partisan messages as well, though not usually in my observation in mainstream messages from say the Administration, NASA/NOAA or major environmental groups. Worst you can say is that the latter in particular sometimes overstate scientific confidence on impacts questions, or at least fail to highlight elements of uncertainty. However critics of climate action routinely commit the fallacy of assuming that uncertainty is our friend, when in fact uncertainty is equally likely not to be our friend, and in fact is itself a valid argument for not performing the experiment of finding out what a transformation of the global climate toward cretaceous hothouse conditions over time looks like at all. Climate change causes shrinking sheep, exploding toads, kidney stones, more prostitution, deaf tropical fish, a move in the Earth’s tilt, less red headed people… need I go on? Those are just the peripheral sciences but are all part of the ‘97% consensus’ band wagon of scientists. The most recent cynical attempt to nudge the global warming message along is the connection to the zika virus. Everyone knows that the faults lie with poor healthcare, prevention and abysmal international bio security but hey, why let a scare story go by without stapling climate change to it. Closer to home with climate itself, we have those who point to disastrous climate change in the past as a warning without noting that those changes were almost all periods of global cooling. Those who never fail to blame some bad weather event on CO2 but never say a peep about stuff that’s improved. Those who show the warming from 1850 and forget to mention that a lot of it prior to 1950 was natural and that it had been naturally warming before that. People know these things and when they measure what they know against what people say, they can spot the lies and stop listening. They know when a climate scientist is thinking of himself, rather than the climate when he leads a jolly to the Antarctic and thinly dresses it up as science, especially when the scientist and buddies get stuck in too much ice. Now THAT was funny. Are sceptics ludicrous? Maybe, maybe not but then we can afford to be, we don’t think the planet needs saving from CO2. What’s your excuse? Well again excuse the bluntness, but this strikes me as pretty lightweight. To pick out a random example, there is/was no serious scientific claim about redheadedness. *Somebody* said something silly about this, yes, but the part where you weave this into a grand narrative about how “scientific consensus” is a joke is purely semi-circular self-indulgence. If you want to say people are prone to speculating too much about what climate change will and won’t affect, knock yourself out. There are a lot of people on the planet, and they’re capable of saying any number of things. It’s a big change, and there’s going to be a lot more speculation over what it may and may not affect over coming years and decades. None of this helps your larger rejection of relevant physical theory and evidence in the slightest. Science is a process that advances through peer review, reproducible evidence, etc. Nobody, of course, is talking about “skeptics” being ludicrous. I and other skeptics have been tending to take a dim view of your sort of ‘political talking point’ level science criticism, as well as your associated claim to the role of “skeptic”. It is nevertheless reassuring that you feel you can “afford to be” ludicrous. Tiny, just in the last week or so we’ve been told that climate change is responsible for depressed dogs, horny cats, and might add 1 minute on a 12 hour return flight! Yet the ludicrous Mr Price questions your use of the word ludicrous. Well, excuse the bluntness but – tough. It’s a free country and if you want others to do as you want, you either have to persuade them or get enough power to make them. The warmist viewpoint is still not a majority in all but a few places like Germany and even there the issue is losing supporters. Why is that do you think? Because the science is so rock solid? And what exactly do you and your fellow ‘skeptics’ expect to see if you get your majority? Is cutting CO2 like saving pantomime fairies? Does the magic only work if everyone stamps their feet and chant ‘we believe in climate change’? Do you think people will just sign blank cheques to be spent on windmills and solar panels? Do you think they’ll rip down their energy inefficient period houses and replace them with insulated tiny boxes? Do you think Greenpeace will endorse nuclear? Do you think Obama, Prince Charles, Gore, Di Caprio and Emma Thompson will stop jetting around the planet telling everyone else that they’re CO2 sinners? What? What is it you think climate sceptic are getting in the way of? What about you? Are you persuaded by the science? Do you put your carbon footprint where your mouth is? Have you charted your way to the 2 tonnes needed to park CO2 rises? Or are you and your mates only down to 4 tonnes like me and find those last 2 tonnes just murder to shift? That’s what the TinyCO2 stands for. It’s about real energy saving, not whining about everyone else’s attitude. Paul, I don’t think warmists notice those stories and/or dismiss them as unimportant. But like UKIP, when they accept the 97% consensus support, they become responsible for the wacky nature of parts of it. If they don’t clearly reject the loons, they are seen to endorse them. Public trust in general is being eroded by bad science but climate science is particularly vulnerable because it has no demonstrable track record of success. That’s even before you get to the policy hangers on and the vast opportunity for fraud that CO2 issues offer for the unscrupulous. My own journey into climate scepticism was triggered by hearing one too many deceptive claims. All the arguments were long on emotional blackmail and short on stuff they could prove. Back in 2005 I took a keen interest in the BBC’s cloud computing attempt and got my first eye opener when the model ran way too warm and had to be recalled after a few weeks. Climate scientists may not be crooks but they do a good impression. Geoff Price, what is a big change? We’ve had lots of predictions of big changes which are manifestly not happening. There is no evidence of “big changes” outside of what might be expected from the climate of even the last thousand years or so. As far as I can see, it is all entirely speculation so far, albeit partly based on computer models. I have no idea what part of “relevant physical theory” you think Tiny_CO2 is rejecting. Price’s biggest problem here is that all those claims about redheads and depressed dogs aren’t *Somebody* saying something silly, they are peer reviewed, published, and science journalized examples of actual ‘Climate Science’. And there are thousands more like them added every year. THAT is the public face of Climate Change. And just like with the Population Bomb and Peak Oil, the public can only be Alarmed by those predictions for so long. Try again, this time with better reasoning. This is a very long way from how real, credible criticism of science is attempted. Anti-science partisans circulating urban legends may not be crooks, but they make a lot of noise. You don’t sound deeply informed. Further comments won’t be accepted on this thread unless they are directly relevant to the post.